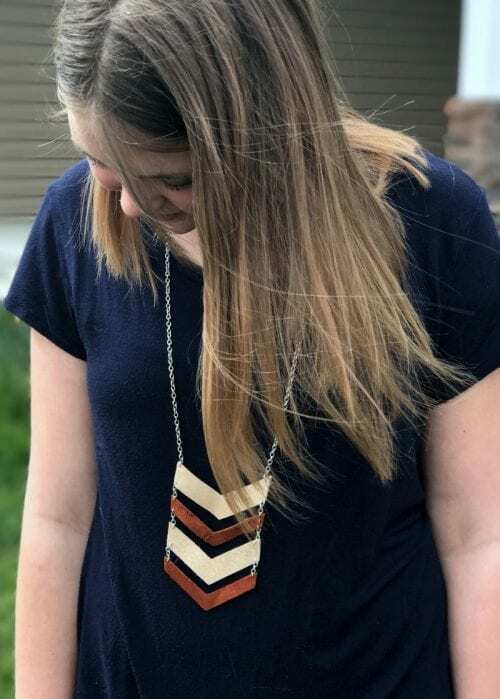 Learn how to make a leather chevron necklace! 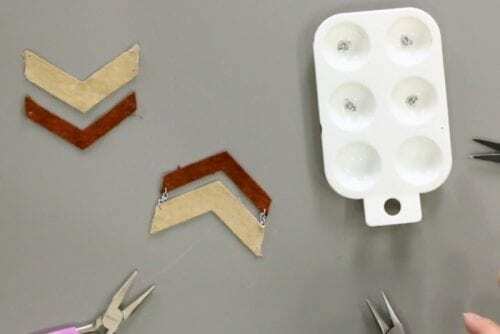 You can make DIY Jewelry with the Cricut Explore and the Deep Cut Blade. An easy DIY craft tutorial idea. Have you ever made handmade jewelry? When you make your own jewelry you can customize it to fit your own personal style and it’s always so much more fun to receive compliments on it when you made it yourself! This Leather Chevron Necklace is my new favorite necklace and it goes with everything. Plus, it gave me a great excuse to try something new with my Cricut Explore! Yup, this necklace was made with the Cricut Explore! Did you know that it could leather? It totally can and it is super easy! Just make sure you have the Deep Cut Blade, Strong Grip Mat, and Cricut Transfer Tape and you are good to go! 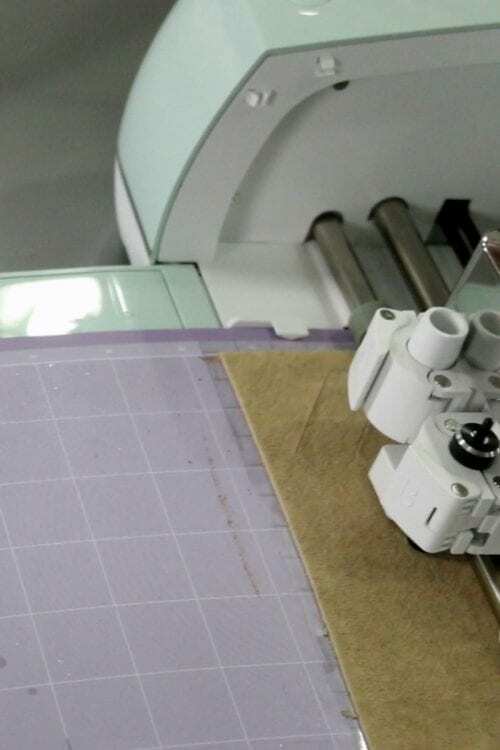 Want to know How to Install the Deep Cut Blade into the Cricut Explore? I have a post and a video to show you exactly how. Like videos? I have a video tutorial for you! Please subscribe to my YouTube Channel so you don’t miss out on any future video tutorials! Using scrap leather makes this project much cheaper than buying full sheets of leather. It’s harder to get specific colors or textures of leather when you buy the bags of scrap, but it should still give you a good selection. Begin by trimming and prepping the leather. Each color of the leather is trimmed to about 2.5 x 7-inch rectangles. To prep the leather, cut a rectangle of transfer tape the same size as the leather piece and lay the leather, bottom side to sticky side of the transfer tape. You want the transfer tape underneath the leather to save your cutting mat. If you lay the leather directly onto the mat, it leaves a lot of leather residue on the mat when you remove. So the stickiness of your mat won’t last as long. Make sure you have the Deep Cut Blade installed. Turn the dial to custom and choose leather from the drop down menu from the cut screen in Cricut Design Space. After the leather is cut, peel off of the cutting mat and remove the transfer tape from behind the leather. Repeat the process above for the 2nd cut with the darker brown leather. There are small holes cut into the corners of the chevron pieces, but since they are so small you may need an awl to poke into the leather to make those holes more pronounced. 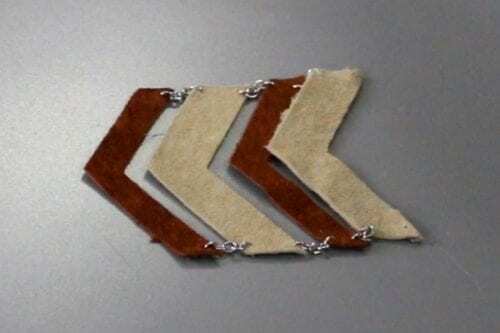 To connect the leather chevron pieces, use jewelry chain. My jewelry chain is pretty small so I used 5 linked chains for each section. To open and close the chains, use two pairs of pliers, one in each hand. With the break in the link facing up, hold one side of the link with each pair of pliers. Hold one side straight and twist the wrist of the other hand. By twisting, you are keeping the shape of the link. Join the chevron sections with the chain in between each section. You can make the necklace as long or as short as you want, but if you make the necklace long enough to slip over your head then you won’t have to add a clasp. Then all that’s left is to wear it in style!! This is my daughter who was modeling it for me, and I still haven’t gotten it back. I guess I need to make another one! 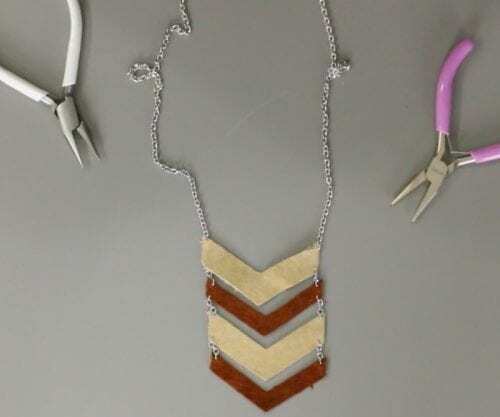 SAVE HOW TO MAKE A LEATHER CHEVRON NECKLACE TO YOUR FAVORITE DIY JEWELRY PINTEREST BOARD! I am so glad you like the leather chevron necklace, Caitlin. Thanks for stopping by! Thank you, Laurie! I am so glad that you like my Leather Chevron Necklace.